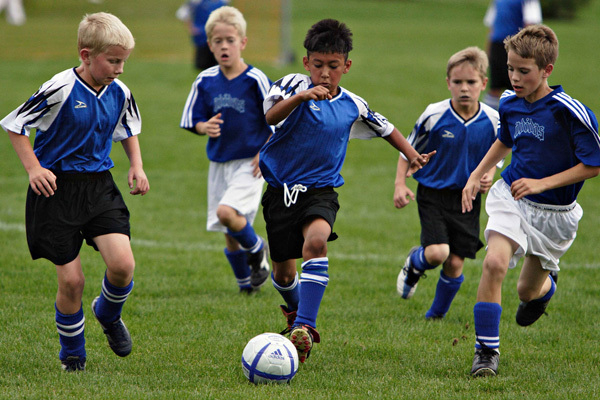 Do you have a little soccer star on your hands? Or maybe you have a kiddo that’s interested in getting his or her first kick on the field. Whatever the case, as a parent, you’re going to need to know about the gear that’s involved in the game. And one of the most important pieces to that puzzle… the shin guard. What Is A Shin Guard? Firstly, what is a shin guard you ask? By definition, a shin guard is “a pad worn to protect the shins.” Simply put, it’s going to keep your kiddo’s legs from getting kicked throughout the games. They’re a required piece of a soccer uniform. And, depending on the age and position of the player, depends on the type of shin guard that’s the best fit for him/her. Let’s take a peek at all the variations. Ankle-shin guards are guards with extra ankle protection. There is soft padding around the foot to help against all of that nearby footwork and the potential of hard kicks and sprains to happen. Usually, there are stirrups that will slide under the feet and ensure that everything stays in place throughout game time. Obviously, this is the best option for younger or less experienced players. 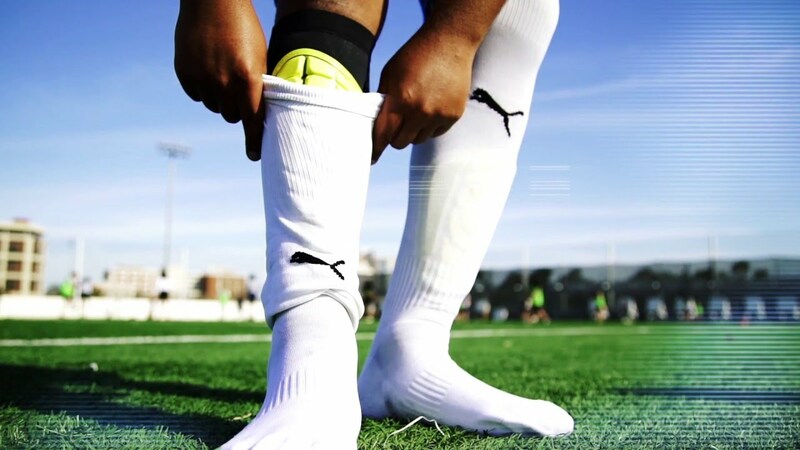 Slip-in shin guards slip right underneath the sock and come with a compression sleeve to ensure it stays put. This particular design is most used by older, more advanced players as it gives the best range of motion without any stirrups or the like holding it in place. Shin socks are shin guards and socks combined! This makes it easier for younger players to keep their gear on correctly and in working order. The protection is pulled on in one piece, just like a regular sock. Before you buy, you’ll have a few different things to consider, including the position your playing. Some points on the field require less or more protection. Let’s have a look at the recommendations. DEFENDERS – need the most protection. They need a heavier shin guard with extra ankle protection. MIDFIELDERS – need protection, but also need to be able to move freely. FORWARDS – need a light shin guard with protection and ankle support. GOALKEEPERS – can wear a light shin guard with minimal protection. Finally, the sizing of the shin guard matters, of course. You’ll find the correct size depending on the height of the player wearing it. Normally, you’ll be able to find size guides in stores or online when scoping out the different options. Keep in mind that the more coverage between the ankle and the knee – the better. Also, you’ll want a fit that falls two inches below the knee. What Are Some Shin Guard Accessories? ANKLE GUARDS: These can be added separately if your buy shin guards that don’t have the added protection and you decide later that you need or want it. SHIN GUARD SLEEVES: Sleeves are perfect for those that wear slip-in guards. Just slide the sleeves over the protection to keep everything snug and ready for game time. SHIN GUARD TAPE: This tape will help those slip in guards stay in place as well – but it also used with classic guards as well. Keep in mind that most players will wrap the tape around the outside of the sock and not the outside of the guard (under the sock). SHIN GUARD STAYS: Stays are just another way to keep your shin guards in place. If compression sleeves are uncomfortable or you don’t ever get the right hold on the tape, this will be your best option. They wrap around your leg and easily clasp closed. The Franklin Field Master shin guards are a slip-in style that comes with compression sleeves to keep everything in place. The actual shell is also vented so it’s more comfortable and cooler for players on the field. They’re also machine washable which parents will love! 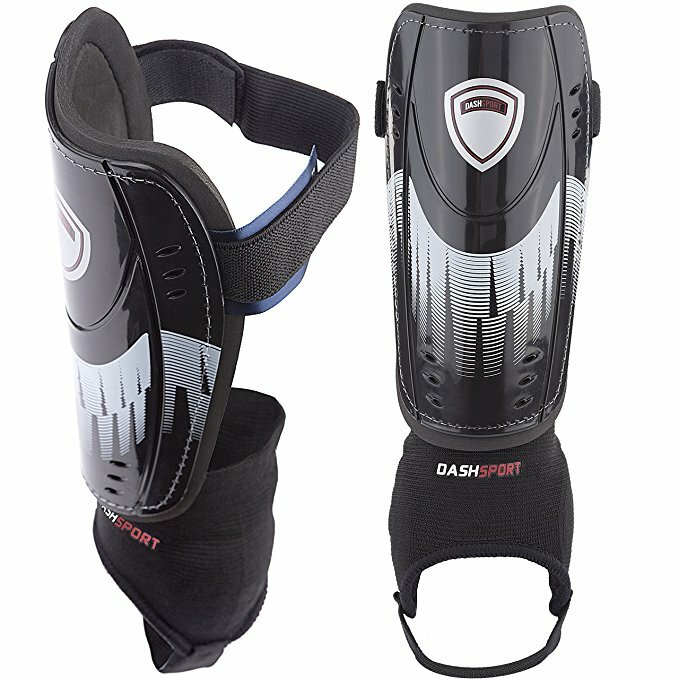 A unisex design with full, complete protection – DashSport shin guards are the ideal design. Not only will parents keep their minds at ease with this choice but the players will have a full range of motion and comfort with them too. There’s a 1-year guarantee with this purchase as well. The plastic shin guard fit right inside for protection and the entire piece goes on in one solid swoop. These are perfect for our younger players, ages 4 – 6, and they are, of course, machine washable so everything is crisp and clean come game time. It’s a really lightweight design so although your little ones will have full coverage, they’ll be able to move freely as well.